'Casa de Las Palmas' is in one of the best positions on the beautiful El Capistrano Village. It is a light and sunny family house, not an apartment, set over 2 floors, furnished, decorated and maintained to a very high standard. The house has gas central heating and air conditioning throughout. There is no extra charge for this. The house has WIFI, a wall safe, DVD/CD player and flat screen TV with an extensive list of channels including BBC, Sky and a number of European channels. On the ground floor there is an open plan lounge, dining area and kitchen. Off the dining area there is a large south facing terrace plus private walled garden. This terrace is south facing and private, with a wind-out canopy, smaller parasols, table and chairs and sun loungers. The kitchen is well-eqipped with a gas cooker, electric oven, fridge and washing machine. There are ample food cupboards, cutlery, pots and pans and crockery. The ground floor also has a toilet and cupboard. Upstairs there are two bedrooms, both of which are south facing with beautiful panoramic sea views and views over Nerja. One bedroom has a large ensuite bathroom with bath and shower cubicle. The other has a double bed with a shower room just outside its door. There is also a south facing terrace with extensive views off the double bedroom, with a table and chairs. Each bedroom has a ceiling fan. There is also a Juliet balcony with some mountain views. The spacious accommodation sleeps up to 5 very comfortably. The outside of the house is extensively planted with geraniums, bougainvillea, a lemon tree and a variety of shrubs. The garden is lawned and edged with flower-beds. There is a clothes dryer, sun loungers and portable BBQ. Casa de las Palmas is situated in one of the nicest areas of El Capistrano Village, a much sought after and photographed beauty spot with cobbled pathways and balconies hanging with colourful bougainvillea and jasmine. The house is cleaned and prepared for you arrival by our management company who supply bed linen and towels. They will also clean at the end of your holiday. A welcome food pack is included in the rental price for guests arriving on Sundays. This usually includes bread, milk, eggs and water. Entry to the house is 15.00hr and we would ask you to leave by 10.00hr on your last day. A few minutes stroll away are the 3 large swimming pools plus 2 children's pools, with poolside snacks and drinks. El Capistrano Village has a well stocked supermarket, ATM, laundry and small centre with car hire facilities. Close by are two large supermarkets, tennis and bowling club and two hotels. Nerja is a five minute bus ride or a 20-30 minute walk. There are a number of beaches in Nerja, an old centre with beautiful streets, countless bars and restaurants and a thriving Cultural Centre. Casa de las Palmas complies with the new Andalucian Laws in terms of standards. The Registration Number is VFT/MA/008087. Please email us if you would like more photos or more information. We live in Scotland where we enjoy the benefits of the wonderful capital city of Edinburgh and all the outdoor pursuits that the Highlands offer. We first visited El Capistrano, Nerja in the 80s and returned on many occasions before buying the villa. We love: the layout of the house with its sunny outside spaces; the beautiful gardens of El Capistrano; the restaurant lined pedestrian streets of Nerja and the opportunities for hiking in the immediate area. Las Palmas 144 is a semi-detached house situated on one of the garden-lined pedestrian streets of El Capistrano Village. It is only 5 minutes walk from the large swimming pool, restaurants and supermarket. We love sitting on the sunny south-facing terraces that overlook the sea to eat, relax or watch the sunsets over the Mediterranean If the light is right around sunset, you can sometimes see Africa. Casa de Las Palmas is a truly lovely house which has been much appreciated by its many visitors over the years. En-suite to bedroom 2 with bath, toilet, basin and separate shower cubicle. 2nd shower room with shower cubicle, toilet and wash basin. Cloakroom on the ground floor with toilet and wash basin. Lounge and both bedrooms have air conditioning units. Gas central heating is available in the winter and is included in the price. Our Management Company supplies fresh linen for your stay. Parking is available within 50 metres. Our Management Company supplies one hand towel and one bath towel for each guest. Large open-plan lounge/dining room with feature fireplace and French doors leading to the large south facing, sunny terrace and private walled garden. Dining table and 4 chairs adjacent to kitchen in open plan lounge. Patio doors to south-facing terrace with covered area. New Fibre Optic Cable has been installed. There is a large selection of paper backs. There is a small selection of jigsaws and board games. In the cellar there are spades and pails and balls left by guests. There is also a collection of colouring pencils and felt pens. Walled garden, mostly grass, with dryer, sun loungers and floral beds. One south facing balcony off the double bedroom with expansive sea views, coastline of Maro and views of Nerja. Available locally at Burriana Beach. The ski slopes of Sierra Nevada are approximately 2 hours away. The snow is usually good throughout the season. The nearest golf course to Nerja is approximately 20 minutes drive to the west. There are others further afield. There are two large swimming pools with small paddling pool 4 minutes walk from the villa. There is another pool and children's pool in the pueblo area. The pools are supervised by a life guard. Baby equipment can be arranged through the owners via the management team 'Menyber', e.g. cot, highchair and stair-gate. There is a charge for this. what a beautiful find !!! Nerja is always my favourite holiday destination but even more so this year. The house had everything you could wish for and we were so pleased with it. Thanks for your kind words! We are glad that you enjoyed your stay! A lovely villa, well maintained,spacious and very comfortably furnished. We have been to Capistrano Village quite a few times over about 10 years, and would say that this is the nicest property we have stayed in. It is located in a very pretty and quiet part of the village with beautiful views, and all facilities i.e. shop, pool and restaurant are easy to get to. We had a lovely holiday, and enjoyed the relaxed atmosphere of Capistrano. The town is lively, and has a great atmosphere in the evenings. Walking on the Balcon to just look at the sea and stroll along and watch the entertainers and artists is great. So, we would say that Nerja is a really nice resort for a holiday, and this property is certainly one we would recommend. Thanks for the kind remarks about the villa, El Capistrano and Nerja. We agree with them. Our guests appreciate the comforts of the house, its outside space and terraces and its south facing aspect. We are glad that you enjoyed your holiday. We have stayed at Casa Las Palmas several times on our visits to Nerja. This property and El Capistrano village are beautifully maintained and in an ideal location. As previous reviewers have said the house is extremely well equipped, clean and comfortable. 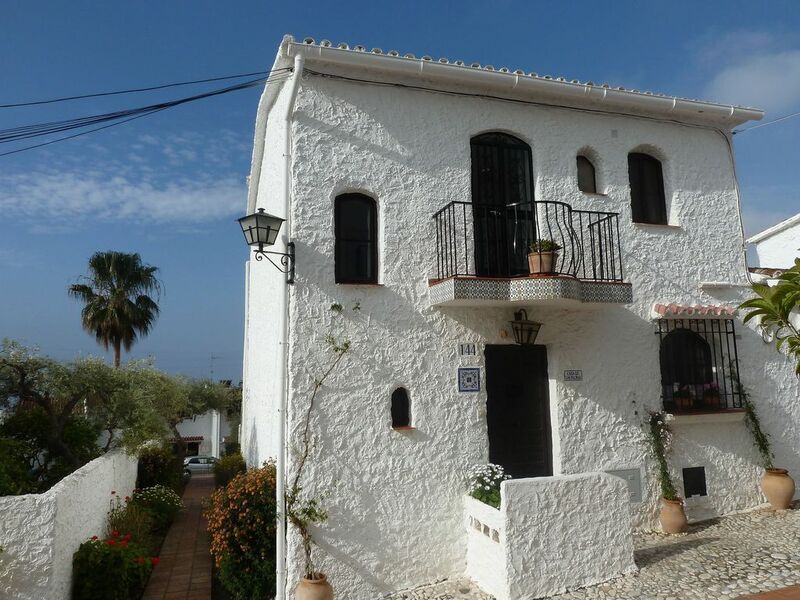 It retains Spanish character and charm that is not often found in holiday properties. My husband has mobility problems but finds the walk down in to town comfortable. There is, however, a good bus service to and from the town to El Capistrano. The taxis are very reasonably priced for those late night return journeys after a relaxing time people watching with a glass of wine down in the main square in Nerja. The town has a large variety of good places to eat , drink and shop ( not necessarily in that order). There are lots of lovely places to visit and beautiful beaches to enjoy. We have loved our visits and really hope to return soon. Superior equipped, clean spacious, well maintained villa. Lots of space, lovely private garden which is not overlooked. Lots and lots of little extras like a cool box and freezer blocks, portable brolly and chairs for Burriana Beach and even a sunshade for your hire car. Welcome pack in the fridge was handy as we arrived Sunday. Comfy bed, pillows and nice bedding. A lovely patio and twin balconies, one with stunning views. Everything went like clockwork. We never tire of Nerja, this was our third holiday and the best accommodation yet, would recommend to anyone. The main beach, Burriana Beach, is just 5 minutes drive or 20 minutes walk. This is a lovely area with many good fish restaurants and bars. Depending on the season and weather, some water sports are available. There are other beaches in Nerja (see town map). A bus service links El Capistrano to Nerja town, every hour. There are also some more remote beaches along the coast to the east. Malaga airport is approximately 35 miles from Nerja, and around 50 minutes driving on the motorway. Car hire is not essential, but is recommended. There is car parking space close to the villa. Nerja town centre is about 5 minutes drive or 25 minutes if walking. The villa is a few minutes stroll away from the heart of the El Capistrano Village where you will find the well-stocked supermarket, restaurant, travel agent, car hire, cash point and public telephones. There are tennis courts and outdoor short bowling less than 10 minutes walk away from the villa. There are other supermarkets close by. Nerja Caves - wonderful prehistoric caverns. They are the 3rd most visited monument in the whole of Spain. Nerja town has many good restaurants and shops. It is still a very Spanish town but with a cosmopolitan air. It retains an old world charm with its old white washed houses and winding streets. The famous 'Balcon de Europa' is a wonderful viewing point above the sea. Sit here at one of the many sidewalk cafes and watch the world go by. Granada - This magnificent city is approximately 1.5 hours drive away. Also accessible are: Seville (approx 3.5 hours); Cordoba (approx 3.5 hours); Marbella and Puerto Banus (approx 1.5 hours). Drive a few miles inland to find many of the area's, 'white villages'. Frigiliana is the closest - just 15 minutes driving brings you to this beautiful little Moorish village. Climb to the top through the winding streets for wonderful views across to the sea and mountains. Booking Notes: Our management company is English speaking and based close by in Nerja. They can be contacted easily if you require any on-site information. Changeover Day: Our changeover day is Sunday, but we are flexible for periods outside the High Season. All requests will be considered. Notes on prices: Prices are for the property per week in UK Pounds. Accommodating 5 people. Long lets over the winter months are negotiable. These rates are fully inclusive. Full gas central heating is included in the weekly rental charges - there are no hidden extras. Cancellations do happen so always re-check with us if your requested dates are not available when you first enquire.